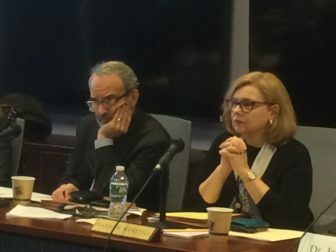 Connecticut Board of Education Chairman Allan Taylor and Education Commissioner Dianna Wentzell at a board of education meeting earlier this year. Wentzell is now serving on an interim basis until a new commissioner is selected. The State Board of Education has cancelled its Wednesday meeting because Gov. Ned Lamont hasn’t yet appointed enough members for the board to have a quorum. Last month, six of the members’ terms expired, leaving five remaining board members. The board vacancies have also been an impediment in the selection of a new education commissioner. Lamont has a preferred candidate, but under state law the Board of Education recommends a candidate or two to the governor. Then the governor nominates his choice to the Connecticut General Assembly. Paul Mounds, Lamont’s chief operating officer, said the governor will be appointing new members to the board soon, possibly including reappointments of some of the board members who retired last month. Laura Stefon, chief of staff and legislative liaison for the state Department of Education, said the lack of a quorum this month is not causing a problem for the state agency. Allan B. Taylor, chairman of the board and one of its five remaining members, said earlier this year that he thinks it makes sense to have the new board members in place before the board recommends a candidate for commissioner. State Education Commissioner Dianna Wentzell has agreed to stay in her post on an interim basis until a new education commissioner is selected. Gov. Ned Lamont's two key education bills -- including one intended to push school districts toward regionalization -- were approved by a legislative committee Friday.